In March of 2012, the St. John’s Community Ministry Center opened and created space for community outreach partners, like Young Life, Boy Scouts, and Narcotics Anonymous. The CMC provides rent-free, collaborative office space for local non-profits who share St. John’s vision. In April, Fellowship of Christian Athletes moved into the CMC. It’s the first time FCA has had a staff member representative for Rowan County. North Rowan and Carson are the only schools in the county that currently have FCA, and before now they were run solely by volunteers. “Since 1954, the Fellowship of Christian Athletes has been challenging coaches and athletes on the professional, college, high school, junior high and youth levels to use the powerful medium of athletics to impact the world for Jesus Christ. FCA focuses on serving local communities by equipping, empowering and encouraging people to make a difference for Christ. Chris has been in the Salisbury area for almost six years. He graduated from Catawba in 2015, served as worship leader at Life Church for one year, then worked at Catawba College for 2 years as director of both the Theology Institute and Volunteer Catawba. 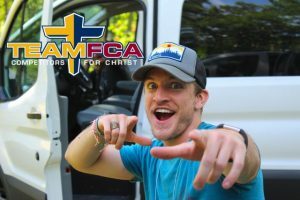 He said he knew God had new plans for him, “I felt a tickle that God had a plan for me to play a bigger part in the kingdom.” He was reluctant to begin work with FCA, because the idea of support raising was outside of his comfort zone. Chris has a great relationship with Susan Nixon and Parker Davis who work in YoungLife at the CMC. Like YoungLife, Chris will use the space primarily as an administrative space. He said he found out about the space available from Susan, YoungLife Area Director, he contacted Pastor Rhodes, and three weeks later, he got the keys. 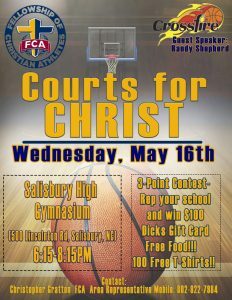 On May 16, FCA will be hosting an event for all area high schoolers called “Courts for Christ” at Salisbury High. There will be food, t-shirts, a three-pointer competition, testimonies, gospel teaching, and an invitation. Chris is still in the process of raising support. He welcomes prayer, volunteer, and financial support. For more information, visit my.fca.org.